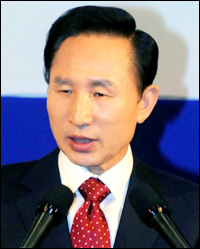 President Lee Myung-bak congratulated U.S. President-elect Barack Obama, Wednesday (KST), on his victory in the election. Cheong Wa Dae said Lee sent a message and delivered his wishes for even more improved Korea-U.S. relations under the Obama presidency. Separately, spokesman Lee Dong-kwan expressed hope that the new U.S. President can play a role in taking the Korea-U.S. alliance to the next level. The spokesman said the election results showed that the American people had chosen change and a new hope. ``President Lee and the U.S. President-elect share a common philosophy in that they consistently put change and reform on top of their agendas,'' the spokesman said. ``The government is aware that Obama has stressed the importance of the Korea-U.S. alliance and supported robust bilateral relations with Korea as a major ally in Asia,'' he said. The spokesman also recalled the fact that Senator Joseph Biden, vice president-elect, led the U.S. resolution to congratulate President Lee after he was elected President last December. ``We expect that Biden will continue to play a leading role for closer relations with Korea so as to move Korea-U.S. relations forward,'' he said.